There are so many ways to procrastinate in the spring. There is planting to do, and weeding, and watering, and checking what has just flowered, and chasing rabbits out of the garden. There’s the awning to put up and the hammock to bring out (which, of course, is followed by extensive testing to make sure that it still works). The farmer’s market reopens. Everyone comes out of the little cocoon they’ve been in for the last 6 months or so of winter. So despite good intentions, no stitching gets done. And if good weather and flowers weren’t enough, I came up with a new project – I started cleaning out my sewing box, which led to cleaning out basement cupboards, and then to sorting through all my threads. I remember the projects that some of these came from. There are some that I’ve purchased in the last 2-3 years, often for playing around while participating in Take a Stitch Tuesday a few years ago. Some of these skeins come from a tablecloth that I embroidered about 15 years ago, for which I way overbought threads – easily twice as many skeins as needed. There are some which came from my grandmother – leftovers of projects long gone, perhaps 30 or 40 or 50 years ago. Some bear labels and tags from companies that are long out of business, names that I don’t recognize, and now am reluctant to use until I find a project “worthy” of them. What could possibly be a project worthy of these? Some evenings don’t go according to plan. My husband is away, so I thought I would make myself an easy dinner, then spend some time relaxing and stitching, and go to bed early (I was up at 4:45 this morning). But what happened is that I started dinner, and then started a load of laundry, and then the phone rang, and then I went to check email, and back to the stove, and in between, I made a batch of cookies, and put them on the stovetop while waiting for the oven to heat up. And then, 10 minutes later, while checking my work email, I smelled something burning, and went into the kitchen, and discovered that the I had put the baking pan with the cookies on a hot burner by mistake. So I grabbed the Pyrex baking dish, and moved it off the burner, and took a step back, and the dish exploded. This didn’t just break. It exploded. It was one of the few times I’ve been truly grateful that I wear glasses. There were shards of glass everywhere. And even better, I had made a batch of linzer bars, which include raspberry jam, so there was raspberry jam mixed with the glass. On the floor, on the counters, on the stove. It looked like a crime scene. Texas Chainsaw Massacre, Ontario division. So I spent the evening cleaning – swept, vacuumed, cleaned all the counters, took apart the stove (glass got in the burners, and under the burners). Tomorrow I’ll wash the floor. Really, I’m too tired and too pissed off to stitch. Lesson learned – and I’m sure there’s a more eloquent way of stating this – too much multitasking ruins the cookies. I was hunting for examples of trellis stitch. Most of what I’ve found are from historical textile collections. For example, the Victoria & Albert Museum has a fabulous jacket – go to their site and look at the original and at an enlarged version of this detail. I also found a number of examples in samplers – mostly with trellis stitch used as a filling, rather than spiral trellis. The darker example was done with a varigated no. 5 perle cotton, the lighter one with a no. 8 perle. It is a little hard to see in this image, but I first made the center with 5 or 6 french knots. After doing those, I backstitched a circle around them, then started working a spiral trellis going out. This would be more effective if the center were in a contrasting color. I may try this again. I called this blog “Snow Days” because I started it in the winter, when snow, and more snow, was all I could think about. But winter is when I stitch, or needlepoint, or embroider, much more so than summer. Once spring comes, I really don’t feel like sitting and focusing on needlework. I want to be outside, in the garden, planting or weeding, or simply admiring. (Admiring quickly turns back to weeding.) I want to be outside walking or bicycling, not indoors. Yes, I worked on small projects on the porch, but I generally don’t keep at it for very long. It is not so enjoyable to work on a tablecloth with yards of material piled on your lap in 90 degree weather. I’m trying to decide what my next project should be. I’m still planning to continue with the monthly Take It Further challenge, but I also want to get back to some longer-term projects. The debate is whether I finish up some of the old projects, or start something new – and if something new, what? How do other people decide what to focus on? Time is a limited commodity – there’s only so much available for me to spend with needlework. I know that if I start doing something I don’t like, it will not get done. If I start a book that I don’t like, I can stop reading and give the book away, or return it to the library, but if I start a needlework project that I don’t like, I’m then left with a pile of thread and materials which reproach me every time I notice it. I guess one question is how to decide how much of a commitment to make to a project. The Dorset buttons I was playing with earlier in the month – those take perhaps an hour, at most. A needlepoint pillow takes a couple of months for me. The other issue is that there are so many things to try. I have great fun checking other blogs and seeing new ideas, new techniques to try. Right now, there are two old projects I’d like to finish. 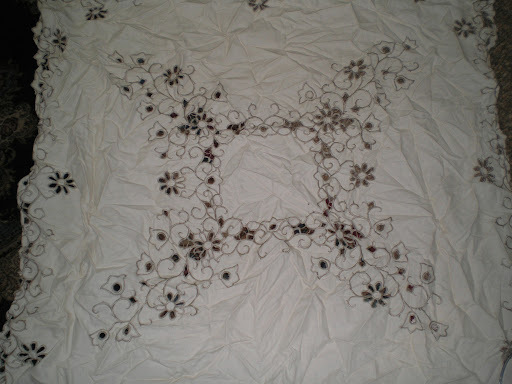 One is a cutwork tablecloth, started perhaps 10 (or 15) years ago. This is about 48″ square. If I focused on it for a month, I could probably finish it. It needs threads trimmed, mistakes fixed, etc. Probably the first thing I need to do is air it out to make sure no mildew has gotten into it. The other item is to finish a needlework canvas that I had been working for a piano bench. 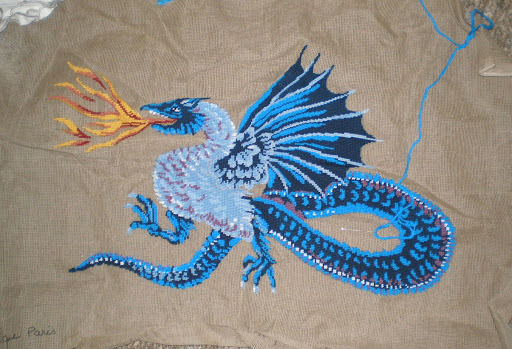 The dragon is largely done, and what is left is the background. Either I’m in for a couple of months of basketweave, or I need to come up with something a bit more interesting to do for the background. Since it is intended for a bench, the background needs to wear well – no openwork here. And did I mention that I don’t currently have a piano bench to fit this canvas? I may have gotten the canvas originally at Tapisseries de la Bucherie in Paris, but it has been so long that I’m not positive about that. It would have been at least 10 years ago, back when the US$ was worth a lot more. 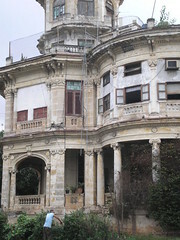 Hi – I’m back from a week in Havana. It was an absolutely fascinating week. 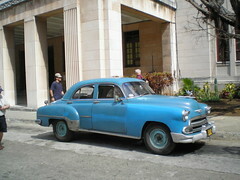 Most people know that Cuba has many old cars from the 50’s. That was my main image of the city before going there. 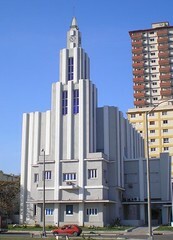 But I didn’t expect to be intrigued with the architecture – everything from Spanish colonial to Art Deco to Soviet apartment blocks (how completely awful!). The infrastructure – buildings, transportation, roads, everything – is crumbling and in desperate need of repair, and the economy is absurd (I’m trying to think of a better word, but at the moment I can’t), but the people were very friendly. Here are just a couple of pictures. View of “El Morro” – the lighthouse and fort at the entrance to Havana harbor. I’m off to find some sun … back next week. TIF will have to wait while my fingers defrost.